Playgrounds offer many benefits and childhood opportunities for learning. In fact, playground equipment and child development are closely linked. Children can work on their mental and emotional development by building confidence as they master play equipment such as swings and slides. They can also build social skills as they learn to share, take turns and play together. There are many developmental benefits of playgrounds. Physical play and exercise can help children build physical growth and strength. Playing on the playground can be especially useful in helping children develop fine motor skills, balance and coordination. Balance refers to the ability to keep a controlled position or posture during a specific task. Walking, climbing or even sitting all require balance. There are two types of balance. Dynamic balance refers to the ability to stay in position during activities that require movement, such as walking. Static balance refers to the ability to maintain position during stationary tasks such as standing or sitting. Coordination refers to the ability to correctly interpret multiple signals to do more complex physical tasks. Hand-eye coordination, for example, requires children to correctly interpret visual information in a way that allows them to catch a ball. This seemingly simple task involves neurological activity, physical control and reflexes, among other abilities. Motor skills are sometimes divided into two categories: gross motor skills and fine motor skills. Gross motor skills refer to skills which include many large muscle groups and the whole body. They include skills needed to climb, walk and jump. Children need to develop these skills before mastering fine motor skills. Fine motor skills include small, controlled body movements involving more limited numbers of muscles. These skills allow us to hold a pencil, write, hold a book and open a package. These skills require more patience for kids, especially for more detailed and delicate tasks. Why Are Balance, Coordination and Fine Motor Skills Important? Fine motor skills, coordination and balance are essential for child development. The development of these skills can help with day-to-day activities, such as walking, play and learning. For example, children who develop gross motor skills can sit up, crawl, walk and play. 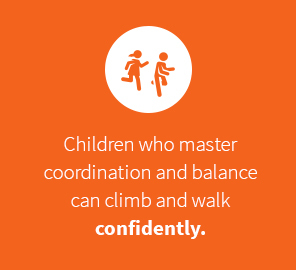 Children who master coordination and balance can climb and walk confidently. Fine motor skills allow children to pick up a book, feed themselves, tie their shoelaces and perform many of the other small tasks which slowly make them more confident and independent. Coordination, balance and motor skills are also important to minimize fatigue. When children are just learning these skills, they expend large amounts of energy and mental acuity to master these abilities. If you have ever watched a child learning to walk, you can see them spending a great deal of time and effort on the activity. As these skills become more evolved, they become automatic, so an older child can walk without expending much energy and without thinking much about it. Once children can walk naturally, they can focus on other aspects of development. Fine motor skills, balance and coordination are also necessary to help children play sports, stay active and exercise, which is important for overall health. Gross motor skills help children catch a ball, while balance and coordination are important for children to jump, climb and play sports without falling over. Developed physical skills are also necessary for the fluid movement necessary to play sports well. 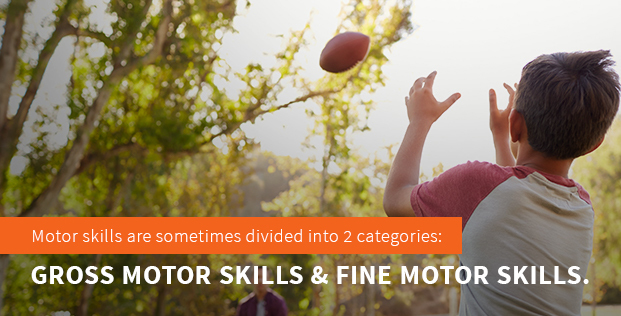 Mastering these skills can also help a child reduce the likelihood of injury. Children with strong balance and coordination are less likely to fall over when climbing stairs or walking along an uneven surface. Gross motor skills, balance and coordination can also help children build their core muscles, which helps them stay more stable during movement and when sitting, reducing the likelihood of injury. Fine motor skills can also help prevent injuries by ensuring children have the ability to complete tasks without accidentally hurting themselves by crushing their fingers in a book or otherwise injuring themselves. Children who have mastered fine motor skills are able to more able to do things like stringing beads on a pipe cleaner without poking themselves. 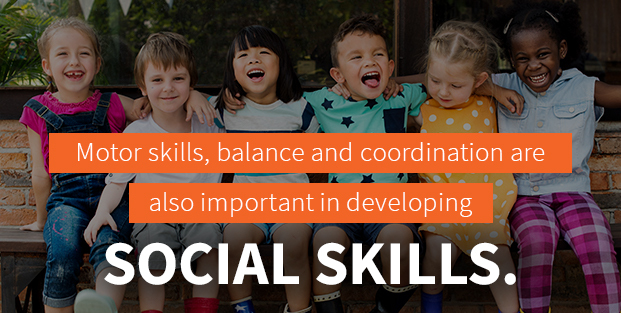 Motor skills, balance and coordination are also important in developing social skills. Children with good physical skills can master activities such as sports, playground use, and other, giving them even more opportunities to interact with their peers. In addition, children who master physical skills can participate in activities such as bike riding or team sports, and have better developed physical skills and ability to avoid issues like running into other children. With these skills, they can more easily make friends and become part of different social groups. Developing these skills can also help develop emotional strength by encouraging children to be independent and to feel confident. 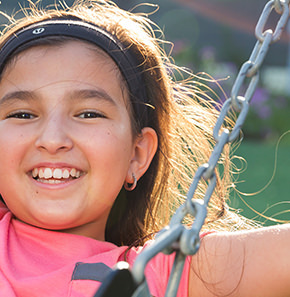 Children who have the physical ability to master new playground equipment or games often feel comfortable trying new games, which allows them to develop independently and to learn new things. Physical confidence can help curb anxiety and fear that may be associated with a lack of coordination and can help encourage them to try new things. Children who master balance, coordination and motor skills can also be more primed for school and academic performance. Kids who master physical skills can sit more comfortably because they have the appropriate posture. They can also handle things such as writing or opening a book more easily because they have the motor skills to hold a pencil, turn pages and the other skills needed to complete school tasks. How Can Playing on the Playground Improve These Skills? Walking on something above the surface level of the ground or pavement can help children develop balance and coordination. Balance beams and other challenging surfaces encourage children to build their core strength and to learn how to balance their bodies in response to level and direction changes. Starting with low surfaces is important to allow children to develop the confidence and skills needed to move on to balance beams and other advanced equipment. The Unity® Stepper is one option for playgrounds for developing balance and coordination. The stepping stones can connect pieces of equipment, or they can stand alone. They can help children develop physical skills such as balance while they are also developing their social skills. Kids can use them to play imagination games, such as pretending they are crossing a snake-infested river. Large and small steps of different sizes and heights can help develop coordination. Climbers allow children to develop core strength, as well as balance and coordination. Climbers also require children to grasp hand rests, building gross motor skills. Climbers are often better for advanced children who’ve already mastered basic balance and coordination. They can help build confidence, and can ensure children build physical strength, as well. Mini Mountains are a great type of beginner climber. You can arrange these climbing squares in different configurations up to four blocks high. Their three-point climbing surface ensures balance and promotes safety while encouraging children to climb in different ways and explore different types of movement while climbing. Children can play together or alone. These climbers are also great for children who are just developing their coordination and balance, since caregivers can stand near the climbers to help children climb correctly. Climbers and other equipment inspired by the natural environment are a great option for building coordination and balance. Children are naturally intrigued by rocks, trees and other natural environments where they play. Unfortunately, natural environments pose several risks. Trees may not have sturdy branches, and rocks may be too slippery or sharp to climb safely. Playground equipment that’s designed to mimic nature, but which provides a safer and more stable surface, helps children explore the natural world through their senses, such as the sense of touch, while also helping them build their physical skills. The Rock Log, for example, is a diverse piece of playground equipment that can serve as a bridge, sitting surface or balance beam. Children can sit on the log if they’re just developing their coordination and balance skills. They can also walk or stand on the log as they further develop their skills and confidence. Activity panels are great for promoting fine motor skills because they require children to push buttons, adjust small knobs and interact with a surface which can be similar to a book or a writing surface. Themed activity panels can also keep children’s interest long enough to allow them to explore different subject areas. Many activity panels help children learn things like numbers or letters. This can help give them an advantage in school. The Fire House is a great solution if you are interested in bringing an activity panel to your play area. There is a maze panel which has rotating pieces to help children develop hand-eye coordination as well as fine motor skills. There are spinners, levers and clickers to engage children as they practice these skills. These panels are designed especially for early childhood development, and panels are centered on a firehouse theme, so children can let their imaginations soar and pretend they are saving lives as they develop their skills. The Fire House can also be a great way to develop social skills as kids work together to race to the rescue. Traditional climbers are similar to wall climbers. They usually feature either ropes, steps or a rocklike surface with hand- and footrests to allow children to ascend up a wall-like structure. Innovative climbers encourage children to develop balance and coordination, as well as motor skills, because they can use their bodies in unique ways. The Fire Hose Climber, for example, is a spiral close to the surface of the ground. It can be used in many different ways. Children can climb through, over or in and out of the spiral sections. This equipment helps build coordination and balance and lets kids explore different types of movements. It can be used as part of a larger themed play area involving fire equipment, encouraging children to imagine themselves as heroes saving others. Another way to build balance and coordination is with playground structures that include many activity stations. 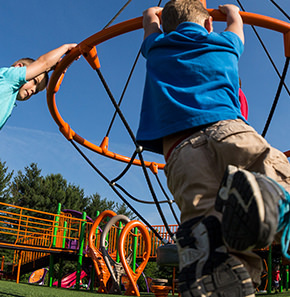 Complete playgrounds, unlike individual playground equipment, encourage children to move from activity to activity, building balance and coordination with different types of movement. In addition, complete playground structures encourage children to explore different activities. It can also be more effective, since even if kids don’t feel compelled to try one activity that helps build them develop coordination or balance, they may still find another activity that inspires their imaginations while helping them develop these physical skills. The Bambino Kiddie Corner is an ideal complete play solution for smaller spaces and younger children. This play area includes a double slide, four activity panels, a climbing area, a seating area, a platform and multiple components. Ideal for ages 2 to 5, this playground solution lets children develop fine motor skills as they play with color, numbers, music and movement at the activity panels. It also allows children to develop balance and coordination, as well as motor skills, as they climb, walk and slide around the activity areas. 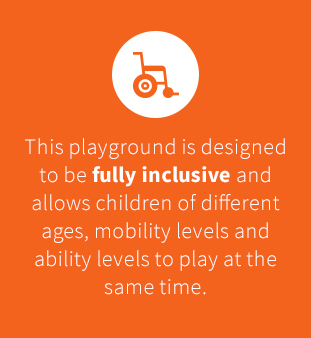 This playground is designed to be fully inclusive and allows children of different ages, mobility levels and ability levels to play at the same time. With a few careful design considerations, you can create a play space that will engage and develop children’s balance, coordination and fine motor skills. If you’d like to develop a play area that encourages the development of coordination, motor skills and balance, you’ll want to start by considering the children playing on your playground. This includes thinking about their developmental levels and how many children could potentially be on the playground at one time. You may wish to create a playground for children who are at different stages of development when it comes to balance and coordination and how you design your playground may depend on the number of children who will be using it at once. Opportunities to develop multiple skills. When choosing playground equipment, you will also want to consider equipment which allows children to work on multiple skills at once. For example, activity panels can help build fine motor skills, while climbers can build gross motor skills, in addition to balance and coordination. Combining the two-in-one play area can encourage children to work on all their skills at the same time. Playground equipment such as seesaws and motion riders encourage children to develop fine motor skills by grasping handles as well as balance and coordination, since the play involves movement. Of course, safety is paramount. You will want to ensure there is a proper surface around and underneath all equipment, especially as children are developing balance and coordination and may still experience falls as they are still mastering the skills. Look for equipment that is sturdy and reliable and meets safety standards. Inspect surfacing frequently and choose the surfacing that is most appropriate for your equipment height and the types of equipment you are considering. Playworld has many freestanding pieces of equipment that you can add to a current playground, as well as full play structures to help children develop their physical skills. Our playground equipment is designed to help children develop balance, coordination, strength and fine motor skills. In addition, our equipment encourages children to stay active and to have fun, so they associate physical activity with enjoyment. They’ll want to explore their abilities and to keep trying, even if they don’t master motor skills or balance right away. Playworld works with engineers and child development experts, ensuring our playgrounds and play equipment are designed to encourage child development, as well as fun and creativity. We also work to ensure our pieces of equipment are fully inclusive and allow children of all abilities to develop social, emotional, physical and mental skills. Our playground equipment encourages children to get stronger and more confident. Each piece of Playworld play equipment is designed for the highest standards of safety. Made from quality materials such as reinforced steel or plastic, each piece of equipment is thoroughly tested and carefully designed. We meet or exceed all relevant safety regulations and standards, and we stand by our products to ensure your peace of mind. Our equipment is used all over the country in churches, daycares, schools and communities. Designed to last for years, our playground equipment is a long-term investment in fun and childhood development. We offer a range of equipment, including spring riders, climbers, slides, outdoor playgrounds, indoor play equipment, playground accessories and more. Our designers can even work with you to develop a customized play area so you get the exact play space you need. Or, you can choose from one of our complete playground solutions. We have playground solutions for small spaces or for specific markets. For example, we have play solutions that are ideal for toddlers, churches or daycares. Playworld is focused on creating the best possible customer experience. Our team is highly motivated to help answer all your questions and get everything you need. We help people at every stage of the process, from designing your play area to picking out the right pieces to installation and more. Whenever you have a question, we’re here for you. We can also work with you to design the exact piece you want, and can even help you if you have questions about fundraising or financing. If you’re ready to create a play space that not only encourages physical activity and the development of balance, coordination and motor skills, but also encourages children to play and have fun while building lifelong memories, contact a play expert at Playworld today. We will be happy to help you start building the playground you’ve always wanted.